Luxury self-catering accommodation with stunning views from every window. Five en-suite rooms sleeping up to 12 people. Dale House is a small farm which is the closest building to Ingleborough's sumit. Home-reared sausage, bacon and eggs are included in the generous breakfasts. Stroll around the farm and meet the animals. Double, twin, tripple and family rates. The traveller will find a warm welcome at Croft Gate Bed and Breakfast. Originally a stone-built shippon and barn, the cottage has many quaint features such as old beams, a large stone fireplace (complete with wood burning stove) and stone window-sills. The Old Hill Inn is an ancient inn of great character, part of which dates back to 1615 and the other part 1835. 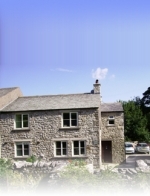 Originally a farm, then Drovers inn, now specialising in delicious home cooked food and excellent puddings. A family of chefs run the establishment, offering excellent food and accommodation. Philpin Farm Campsite situated on our working hill farm in Chapel-le-Dale on the footpath between Ingleborough & Whernside open Easter until October We have a new toilet and shower block. The pub is a 2 minutes walk and 2 miles to Ribblehead Station. Next to the Ribblehead railway station this pub offers locally sourced pub food, B&B, bunkhouse accommodation and a good selection of beers. Gearstones Lodge is a registered charity based in Mirfield. It was formed when the residents of Mirfield purchased, by public subscription, Gearstones Lodge buildings and grounds. The lodge and attached cottage are used to provide residential accommodation, for all sections of the community. The property comprises lounge, dining room, drying room, 5 bedrooms fitted with 6 bunk beds. There are 3 shower rooms with hand basins and toilets. The kitchen is well equipped with an industrial cooker, toasters, fridge, freezer, dishwasher and 2 microwaves. There is a car park attached with space for approximately 12 cars.